On a day James Cartier's family and friends would have celebrated his 27th birthday with smiles and playful teases, his loved ones choked back tears as they laid the Sept. 11 victim to rest. "James' big grin was always the first thing you'd see when he was around," said his brother, Michael Cartier, 24, whose family founded Give Your Voice, a leading World Trade Center victim advocacy group. "He was always eager to lend a hand, eager to make his parents proud. We're going to miss him," he said. Under a gorgeous blue sky, the funeral procession that carried Cartier's coffin to Our Lady of Fatima Church in Jackson Heights, Queens, was escorted by a dozen Harley-Davidsons ridden by former co-workers from Local 3 of the International Brotherhood of Electrical Workers. The bikers — many sporting the Stars and Stripes on their jackets — joined the hundreds of mourners already assembled to bid farewell at a Mass said by the Rev. Freddy Cintron, a family friend. "On Sept. 11, the lives of my family were drastically and forever changed," said Cartier's sister, Jennie Farrell. "The depth of our pain is immeasurable, and we can't forget all of the other families who lost loved ones on that day." 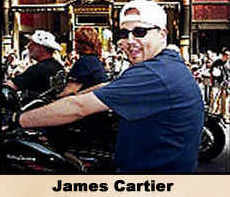 James Cartier was working on the 105th floor of 2 World Trade Center on the morning of the terrorist attack. The speakers were flanked at the altar by two posters full of pictures of Cartier playing with his parents and his six siblings. The Cartier family founded Give Your Voice to honor James because they believed families of civilian victims weren't properly informed about recovery efforts.